Identify and recognize the significance of acoustics as part of the beneficial indoor environmental design criteria for both collaborative and individual workspaces. Assess the performance and aesthetic aspects of wall and floor surfaces as they relate to durability, safety, and interior design flexibility. Explain the various means to accommodate a mobile workforce that looks for readily accessible, available, convenient power and data sources wherever they may work. Determine ways to incorporate better design principles into restroom design for sanitation, health, and overall better workplace design. The places where people work have always needed to accommodate not only the type of work being done but also the organizational or management systems surrounding that work. Agrarian workplaces were necessarily tied to the land being farmed and often caused people to be spread out across a broad area to operate independently. Industrialization brought centralization of the workforce around manufacturing facilities but also required work time synchronization in order for the facility to function. The rise of the “knowledge worker” as first coined by business writer Peter Drucker in 1959 identified the predominance of information- and service-based work shifting work products from “things” to information and services. Our current, interconnected, 24/7 world breaks through these previous restrictions of location, time, and products, offering new opportunities but also bringing challenges of productively managing a diversely structured workforce. In order for architects to design effective workplace environments then, we must be aware of and responsive to the changing needs of workers and management in the context of the evolving workplace. In this course, we will look at some of the drivers of change and some examples of interior building design strategies that can foster exemplary workplace environments. Workplace environments have changed notably from the hierarchical, isolated layouts of the 20th century to more diverse settings that contain spaces for collaboration, individual work, socialization, and learning. Most workplace organizations identify their two largest expenses first as labor costs, and second as real estate. In order to be economically sustainable and/or profitable then, any given organization needs to balance and optimize both of these. The design question usually becomes how best to create an appropriately sized and properly balanced workspace that allows individual workers to be fully engaged (i.e., productive) and helps the organization to thrive. One of the first steps in designing a relevant workplace for a contemporary workforce is to realize that some of the 20th century design approaches were based on modes of working that have become outdated. Manufacturing and industrial facilities often relied on hierarchical organizations with work groups set up in individual “silos” that were quite immobile. Commonly, separate business units occupied separate buildings, where management had closed offices around the perimeter and the remaining staff had cubicles with little or no access to daylight. Typically, everyone was tethered to a desk focused on individual work tasks, and interaction across divisions was minimal. While that model worked well for its time and for certain large organizations such as the military, it should no longer be viewed as the starting point today. Such organizational and physical models can now actually work against contemporary goals of employee engagement and knowledge development, which are universally accepted as the current engines of economic success. 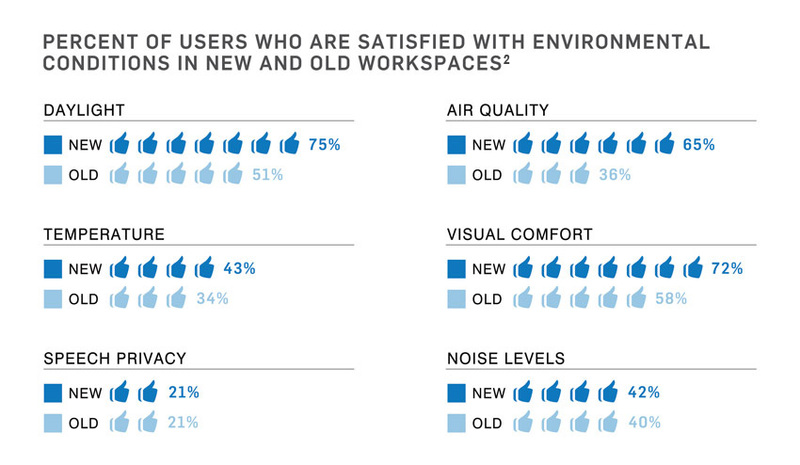 The U.S. General Services Administration (GSA) found that workers who moved from old workspaces to new ones designed to accommodate their work style were generally more satisfied by most measures except for acoustical quality. One of the biggest changes in recent times is the shift from individual work to teamwork or collaboration. The knowledge-based nature and complexity of the work of many organizations has required more input from different people to be effective and successful. In fact, data from a survey of 600 corporate executives conducted by the Gartner Group found that the percentage of workers’ product being dependent on group input increased from about 25 percent in the year 2000 to 60 percent in the year 2010. Further, while the traditional mode was for employees to work on a single project or initiative for a long period of time, today it is much more common that everyone is working on multiple projects simultaneously, requiring multiple collaborations. Given this rather swift change in the nature of work, it is not surprising that a Steelcase/CoreNet Global survey found that workspaces and work activities are out of alignment in many cases. In this survey, more than 40 percent of respondents stated that their workplace “was split 80/20, with 80 percent of space supporting individual work and 20 percent supporting collaborative work. Yet the number of employees whose actual work process followed that same 80/20 individual/collaborative split was only 8 percent.” Clearly, the work processes have changed faster than their environments. With the trends on the changing workplace cited above in mind, the question becomes: What are some of the appropriate design responses? We will take a look at several answers in the following sections. Introducing Plastic Laminate Partitions with Moisture Guard™ Edge Banding. Our Moisture Guard™ Edge Banding fuses with the substrate, creating an elegant, seamless, beveled profile that eliminates those unsightly black lines while increasing moisture resistance and improving durability. 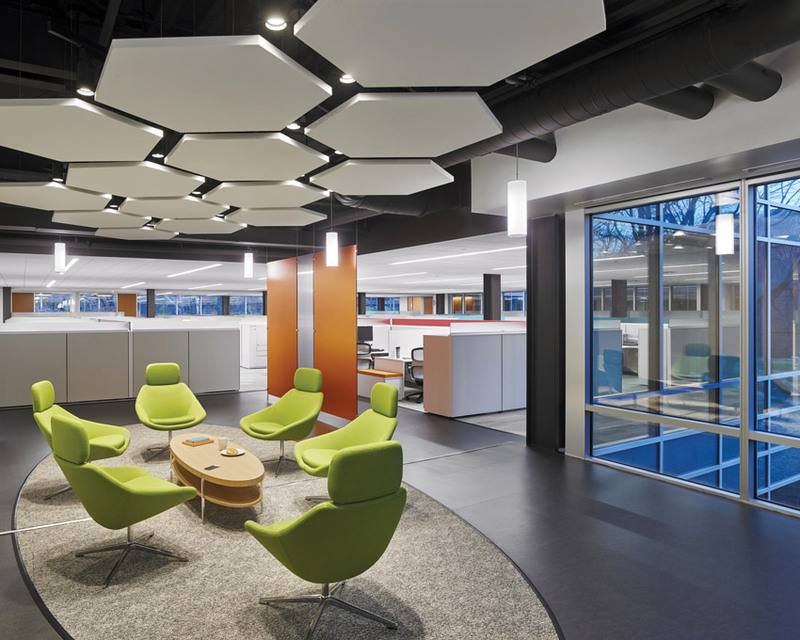 This versatile collection of Symphony® ceiling panels lets you be the director. A complete range of targeted acoustic solutions shares a consistent design—giving you the freedom to combine products in the adjacent space for precise acoustics while maintaining a consistent visual. The collection coordinates with Adagio® and TufCore™ panels. Construction Specialties has significantly revitalized its Acrovyn Wall Panels. The system offers an extensive range of design options, including a variety of thicknesses, panel sizes, edge treatments, trim options, and finishes. Specify Sure Snap™ for a simple demountable solution that can be installed in half the time previously required. Mount this product to the edge of or under your desk or table for convenient power and USB charging solutions at your fingertips. This highly versatile, simple mounting application works for permanent installations or temporary and mobile workstations. Two configurations are available in black, white, or metallic silver. This product is UL listed.